The photo above illustrates surface iridescence. Iridescence is a play of colors caused by the interference of light waves. This phenomenon is also called thin film interference. You have probably seen this effect on soap bubbles and oil sheens. Light reflecting from a thin coating of iron oxide on the piece of novaculite above is producing the play of colors. Light waves are reflected from the top of the iron coating and the base of the iron coating producing multiple waves. A color is seen when the waves interfere constructively. The resultant color is dependent on the thickness of the coating and consequently, streaks and bands of differing color develop since the thickness of the iron oxide coating varies. The colors also change when the angle of reflection is changed. This entry was posted in GeoPic of the Week and tagged colorful, Geology, Geology pictures, iridescence, iron, light waves, natural phenomenon, novaculite, rainbow on June 2, 2017 by argeology. Chalybeate (pronounced ka-lib-e-it), or mineral springs, is a term used when water is highly saturated with iron that precipitates out of solution forming an iron-rich stain along the surface of an outcrop. These iron-rich waters are in solution until reaching the surface, where the iron becomes oxidized, forming an iron coating along the water’s path. The different colors are a result of the different oxidation states of iron. At one time, these mineral springs were believed to have healing powers with many health benefits. Unfortunately, these springs simply leave you with a lingering iron taste with no health benefits, but do provide an aesthetically pleasing photo opportunity. 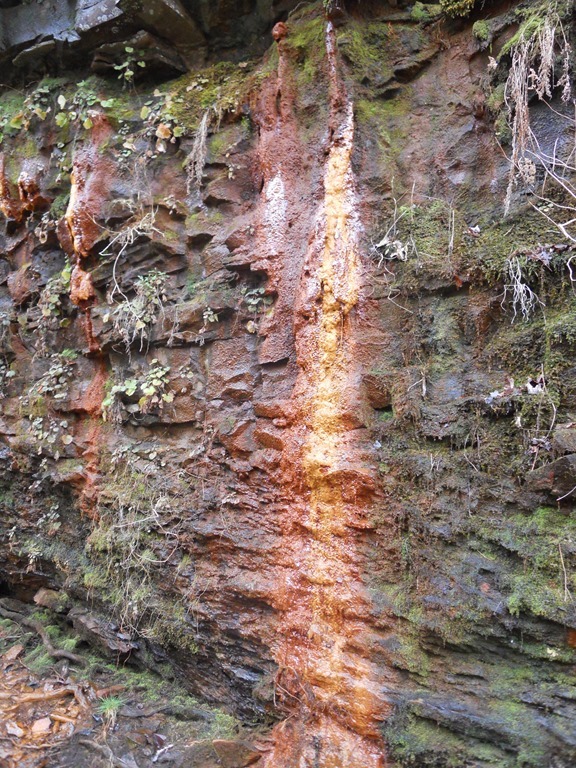 This entry was posted in GeoPic of the Week and tagged Chalybeate spring, iron, oxidation, precipitation, solution, stain on May 29, 2014 by argeology. 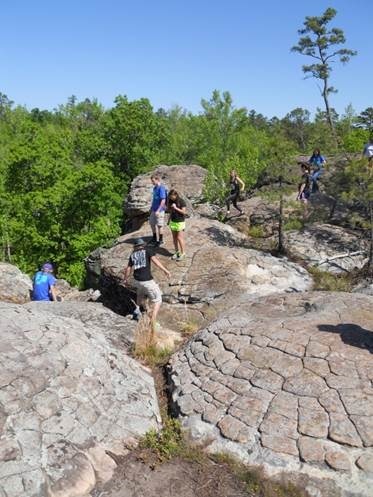 The Arkansas Geological Survey hosted a field trip to Petit Jean State Park for 26 Fountain Lake High School seniors and science club students. The high school seniors are currently in a college geology course taught by Mrs. Jennifer Cox, a former geologist with the AGS. 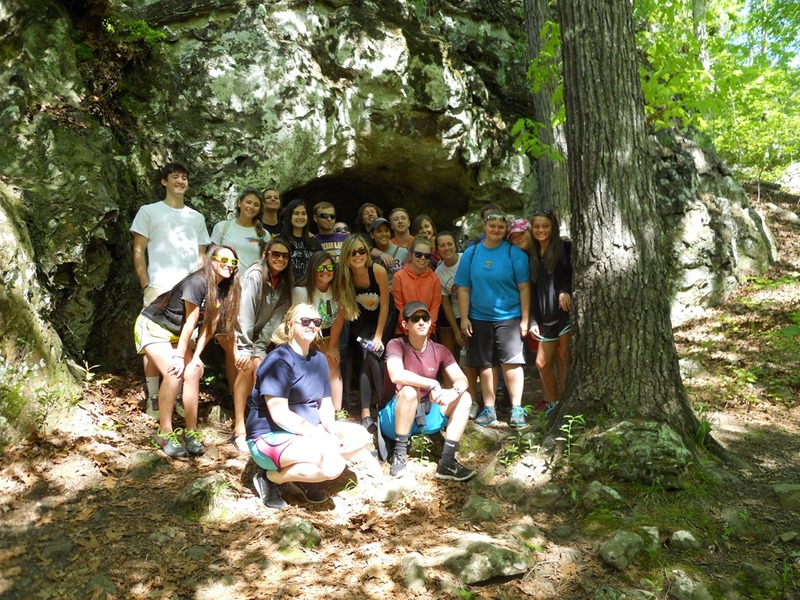 As far as we could tell, these seniors were ready to show off their geologic knowledge. Two students, whom I understand are brothers, were excited enough to buy Muscadine Grape Juice from the Visitor’s Center prior to the start of our trip. Nothing says geology like a good swig to start your day. Our first stop was to Seven Hollows Trail. 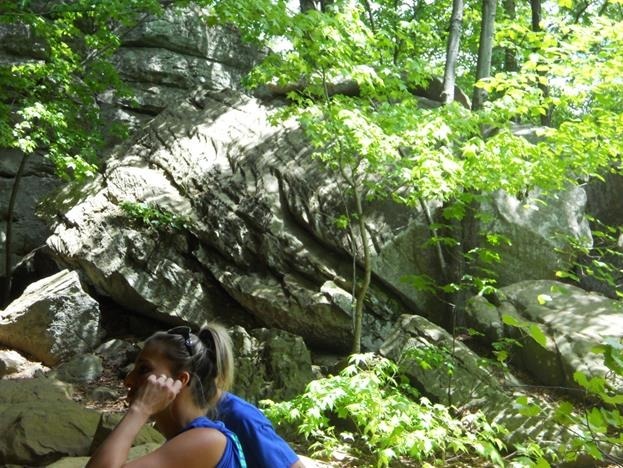 Along the trail, we first looked at liesegang banding and a natural shelter within the Hartshorne Sandstone. Liesegang banding (aka box-work) is created when water percolates through the sandstone and comes in contact with the iron minerals present causing the iron to go into solution. 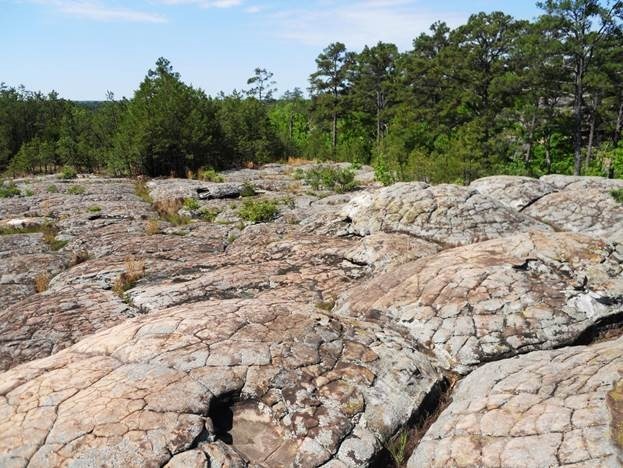 As the rock is exposed to air, oxygen is added to the solution, oxidizing the iron and causing it to precipitate out of solution along exposed joints and/or bedding planes in the rock formation. The iron sometimes precipitates out as box-shaped and triangular patterns. The natural shelter within the sandstone was created as a result of weathering. Again, water percolates through the sandstone and between individual sand grains, causing the grains to loosen and separate from the rock. After millions of years of weathering, large voids are created within the rock. This large void appears to be a prime location for the first of many class photos. 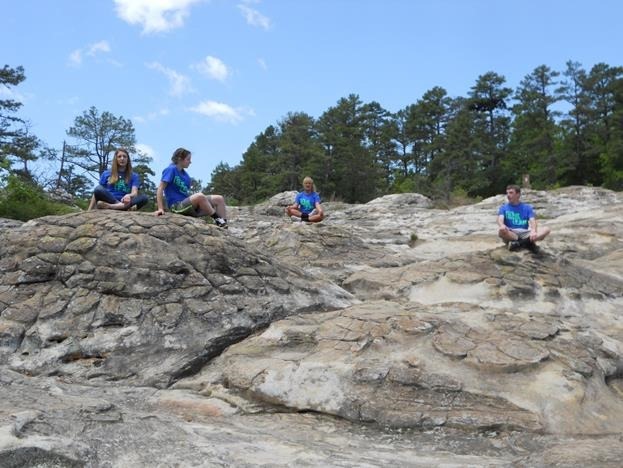 Senior class photo in a natural shelter within the Hartshorne Sandstone. The natural archway is lined with great liesegang banding features. Liesegang bands, or carpet rocks based on their square pattern, adjacent to natural shelter. Our last stop was to Natural Bridge and the turtle rocks above natural bridge. 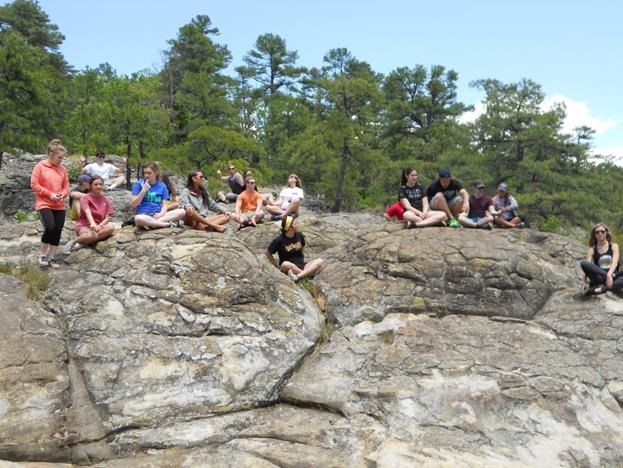 We had some excited young geologists who immediately began to climb on top of the natural bridge. Natural Bridge (left). Again notice the great liesegang bands in the archway. 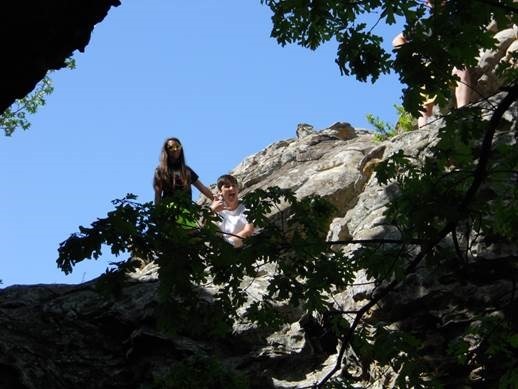 Young adventurous, soon-to-be geologists climbing above natural bridge to the turtle rocks above (right). 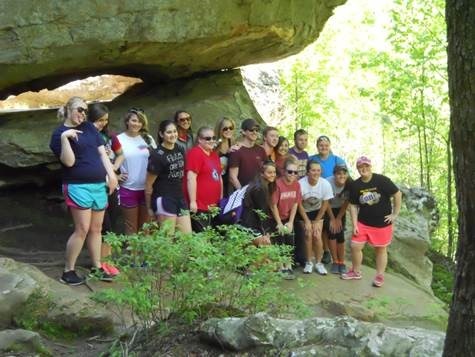 Another senior photo op at natural bridge. 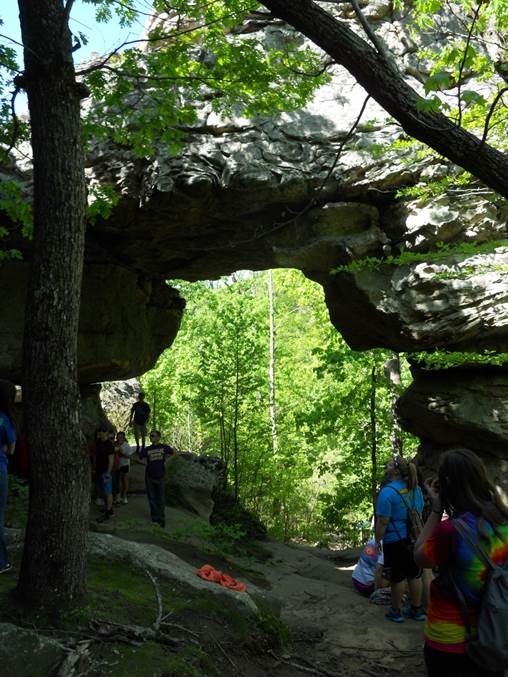 Turtle rocks above natural bridge are some of the best features in Petit Jean State Park. “Turtle Rocks” are unique, mounded polygonal structures that resemble turtle shells. 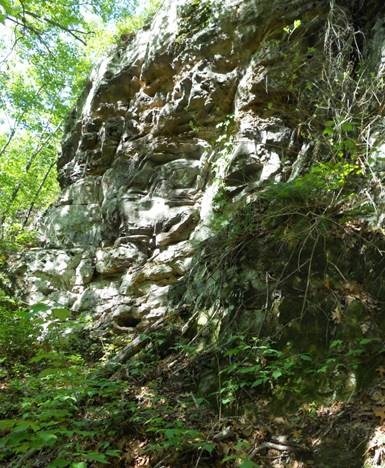 These features are found along the Arkansas River Valley in the Hartshorne Sandstone deposited during the Pennsylvanian Period by ancient river systems. The processes that generate “turtle rocks” are not clearly understood. One explanation suggests that these features were created by a process known as spheroidal weathering, a form of chemical weathering that occurs when water percolates through the rock and between individual sand grains. 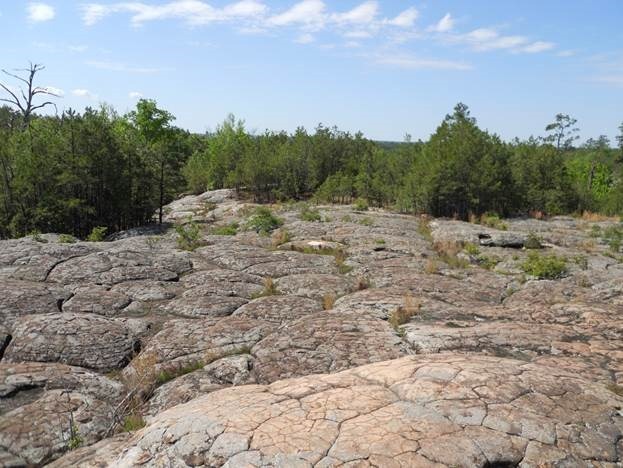 These grains loosen and separate from the rock, especially along corners and edges where the most surface area is exposed, which widens the rock’s natural fractures and creates a rounded, turtle-like shape. Additionally, iron is leached from the rock and precipitated at the surface creating a weathering rind known as case hardening. 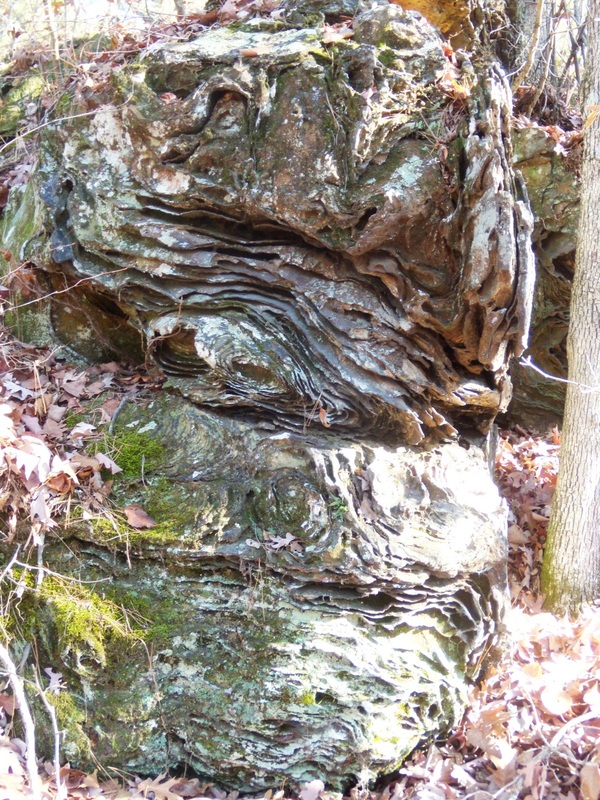 These two processes along with the polygonal joint pattern contribute to this weathering phenomenon. Exploring these great turtle rocks. Everyone was thinking that these features were definitely worth the hike. After exploring these sedimentary features, we headed back up the trail toward the bus, ready for lunch. I’m not sure how anyone had any energy left after the hike, but it seems most of the students finished their lunch pretty quickly so they could play around on the playground. 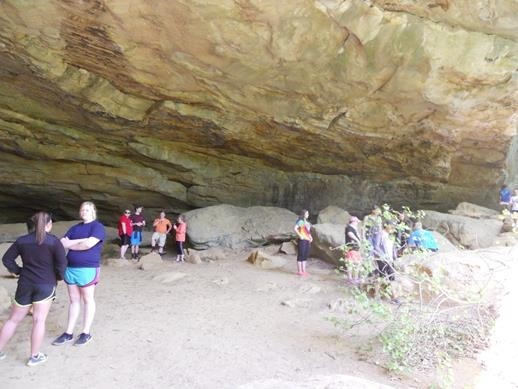 After lunch we headed to Rock House Cave, a large rock shelter within the Hartshorne Sandstone. Honeycomb weathering and cross bedding features are easily visible around Rock House Cave. Honeycomb weathering is created very similarly to how the natural shelters are formed (e.g. Rock House Cave, natural shelter along Seven Hollows Trail), in that water percolates through the sandstone, loosening and separating the sand grains from the rock creating a void. Cross beds are diagonal lines that represent movement of large ripples within the sandstone deposited by an ancient river system that existed here 300 million years ago. These cross beds indicate the direction the river once flowed. Notice the nice cross beds in the middle section of the large boulder above Ms. East’s head. 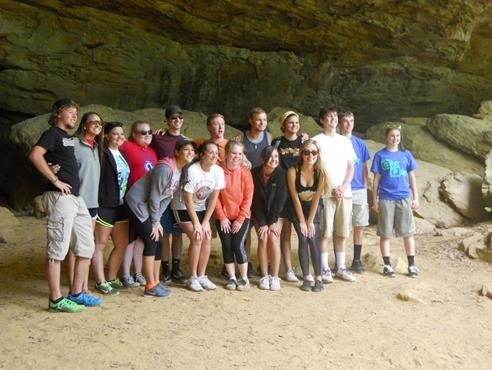 We ended the day with a final photo session in both Rock House Cave and on the turtle rocks located on the trail. There are those Sig Figs (FLHS Science Club). They are reminiscing about the day’s awesome geology field trip. 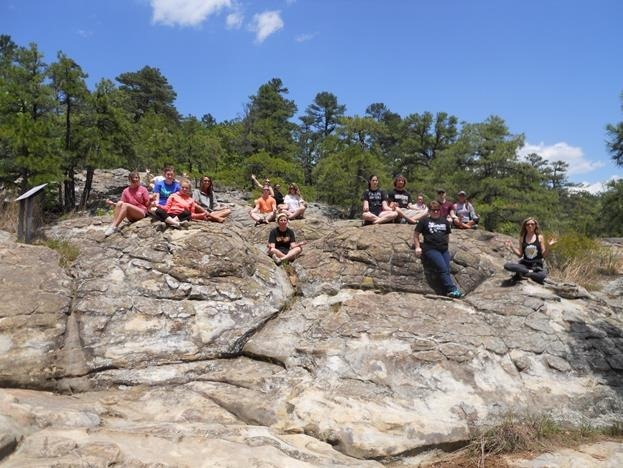 This entry was posted in Field Trip and tagged cross beds, Fountain Lake High School, Hartshorne Sandstone, honeycomb weathering, iron, Liesegang Banding, Natural Bridge, Natural Shelter, Rock House Cave, Seven Hollows Trail, Spheroidal Weathering, Turtle Rocks on May 5, 2014 by argeology. Have you ever noticed a rock that had numerous concentric layers like the sandstone pictured to the left? If so then you’ve seen liesegang bands Strange as they may look these bands occur naturally within many sedimentary rocks and less commonly within igneous and metamorphic rocks. 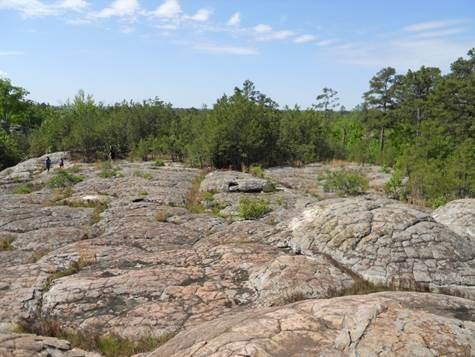 At some point after the rock formed it was buried and saturated with iron-rich ground water and the bands, which are typically an iron-rich mineral such as limonite, precipitated within the rock in repeating rings. Later, it was exposed at the surface and the softer sandstone eroded away leaving the harder rings standing in relief on the rock. Liesegang bands can form an array of visually stunning patterns. Sometimes they form near-perfect cylinders that resemble iron pipes. Liesegang Band resembling an iron pipe. Liesegang bands forming visually stunning patterns. This entry was posted in Sedimentary Features and tagged iron, iron pipe, Liesegang band, limonite, rings, sandstone, Sedimentary on July 23, 2013 by argeology.